Former special-operations soldiers must choose between money and morality in this violent and thought-provoking story. Rating: 3 stars out of 4. When greed runs up against conscience, you’ve got a story. It does in “Triple Frontier,” and the story of that collision is a violent and thought-provoking one. It’s greed that motivates five friends, former special-operations soldiers, to mount a rogue mission to relieve a South American drug cartel of millions in ill-gotten narco dollars. The greed grows out of a sense that after careers spent doing America’s dirty work in war zones around the world, they’ve been cast aside. Five men with very particular sets of skills — a pilot, a planner, shooters all — are left feeling they don’t fit in in civilian society. The most despairing and disaffected of the five (played by Ben Affleck) is a divorced family man trying to scrape by selling condos, trying to raise his resentful teen daughter right and trying to cope with the belief his life is at a dead end. When a buddy (Oscar Isaac) shows up with a proposal to reconnoiter a cartel jungle hideout believed to be jampacked with cash, he’s tempted. But also conflicted. So the mission is mounted, but with many misgivings on the part of everyone except Isaac’s character. Director/co-screenwriter J.C. Chandor (“All Is Lost,” “A Most Violent Year,” which starred Isaac) and Mark Boal, the other credited screenwriter (“The Hurt Locker,” “Zero Dark Thirty”), put the emphasis on highlighting the ambiguous emotions of these men toward the job. They’re well-aware of the risks, but the resentment at being marginalized and the promise of a payoff likely in the millions keeps them on task. Greed overwhelms them when they hit pay dirt, but later they become conscience-stricken as, sure enough, lives are lost and the immorality of the mission bites hard. The tone of “Triple Frontier” (the title is taken from the area where the borders of Brazil, Peru and Colombia meet) is grim and gritty. Chandor keeps the picture tightly centered on the five men. There is no chief villain per se as the drug dealers are essentially anonymous targets who present themselves to be shot. Tough men in tough environments are forced to make tough choices as the law of diminishing returns imposes itself and they have to choose between money and morality if they want to obey the prime directive of the soldier’s code: Leave no man behind. 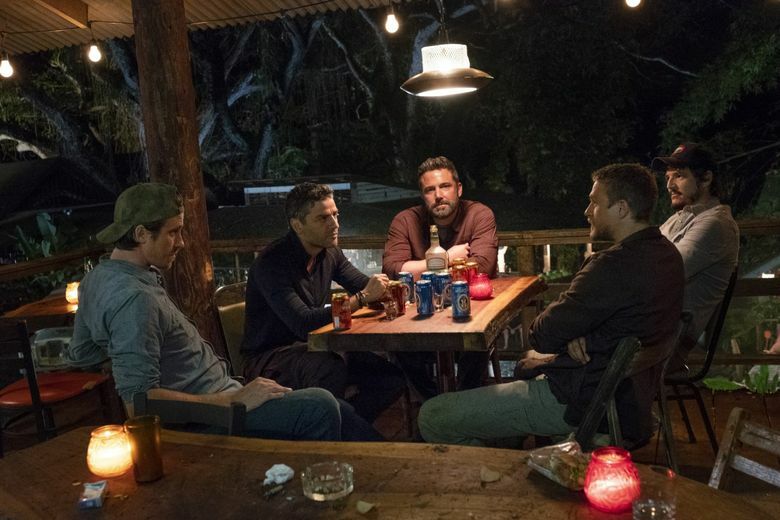 ★★★ “Triple Frontier,” with Ben Affleck, Oscar Isaac, Charlie Hunnam, Garrett Hedlund, Pedro Pascal, Adria Arjona. Directed by J.C. Chandor, from a screenplay by Chandor and Mark Boal. 125 minutes. Rated R for violence and language throughout. Opens March 6 at the Crest.